Logic alone dictates that if 132M barrels are on order for delivery to a storage facility that can only handle 45M barrels that the orders are mostly bogus. You can track the open interest every day right here so don't take my word for it, watch what happens over the next few days as the people who are currently pretending to demand oil in January, roll their contracts to pretend demand for February (already at a ridiculous 268M barrels), March (172Mb) and April (60Mb). Like the great Carnac, I will put the envelope to my head and predict that, by Tuesday, the January barrel count will fall to under 30,000 contracts, while the new front three months will rise by close to 100,000 contacts. This is scam #1 in the energy market and it goes on every month since the "Commodity Futures Modernization Act" of 2000 made it possible for thieves to run the energy markets with virtually no regulations. I've been speaking out on this for years and just this weekend, the NYTimes picked up the ball I tossed up over a year ago (better late than never! ), when I pointed out that the Global oil scam was costing us 50 times more than the Madoff scandal EVERY YEAR! We're not going to go into all that again as I want to highlight scam #2 in the energy markets and that is the weekly manipulation of the oil inventory reports. Yesterday, Criminal Narrators Boosting Crude were very excited to report that we had a 9.9Mb draw in oil inventories. WOW! That sounds like a lot of oil demand doesn't it? Of course, any real news people would mention that the report clearly indicated that "U.S. crude oil imports averaged 7.7 million barrels per day last week, down by 1.4 million barrels per day from the previous week" but CNBC is not news, is it? As I pointed out two weeks ago today, they are nothing more than PROPAGANDA as a station owned by a company that makes a good portion of it's income selling energy-related products and makes much more money when oil prices are high than when they are low. 1.4M barrels a day times 7 days is 9.8 Million barrels that the US was shorted in order to keep the price of oil high - WHY IS NO ONE BEING ARRESTED?!? It's not just American Citizens who are paying the extra $60M per day that the $3 pop in oil costs us, the rest of the World consumes another 70M barrels a day and they are stuck with a $210M per day bill as well for each $3 gain in price. And that, of course, is before the refining mark-ups. Just the $270M a day they screwed us out of this week is a very nice $98.5Bn annual rip-off of the global population or, what I pointed out last year is a Double Madoff! Now consider that the real price of oil, when measured as global output vs. global demand on a historic basis should be closer to $60 a barrel than $90 and you have a TRILLION DOLLAR annual scam going on and our joke of a government does NOTHING to prevent it. 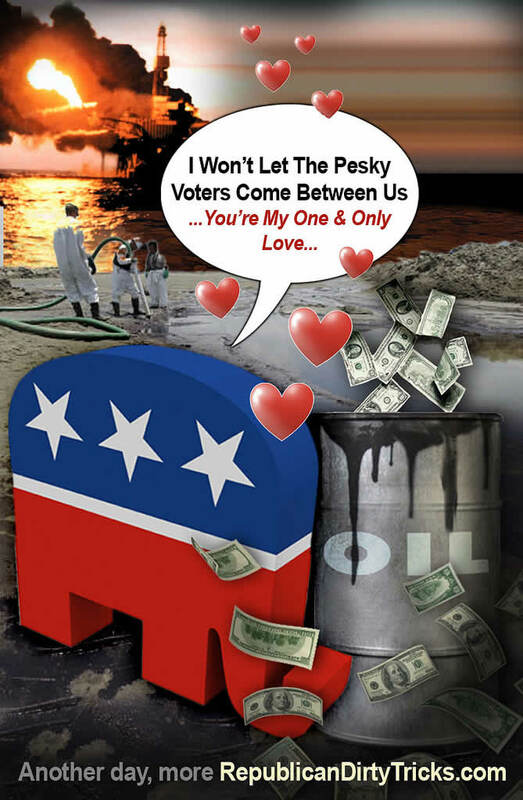 Oh wait, I'm sorry, they do something, they accept massive campaign contributions from the Energy industry to block any legislation meant to put a stop to this on-going crime. Perhaps if it were "just" a Trillion Dollars that was being stolen we could just laugh it off and accept it but the artificially inflated price of oil impacts food and many other products plus, as I mentioned, the refining mark-up alone almost doubles the net cost to consumers so, Globally, we're paying close to $5Tn in inflated prices just so the Energy Cartel can screw us out of $1Tn. It would be much cheaper to just hand them the cash in exchange for charging a fair price for the oil, wouldn't it? By the way, I apologize to my Republican friends for the above cartoon - the Democrats have had two years to do something about this and have proven themselves to be just as big a bunch of sleazeballs as the Republican's ever were. How's that for fair and balanced. This is a GLOBAL problem and it's obviously not going to be fixed by the voters or the people in power so I'm going to reach out to the business community. 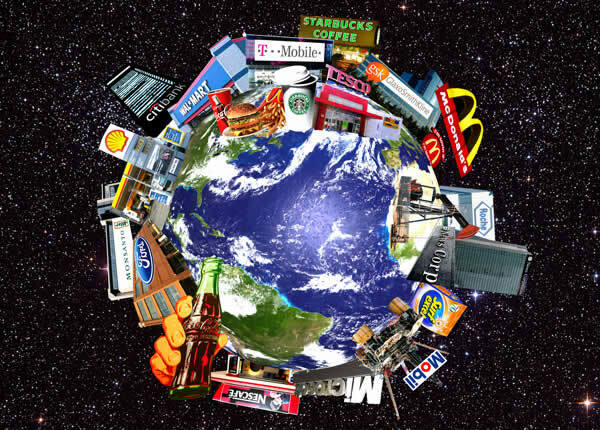 The Global Corporations who do not sell energy products who are also suffering as $5Tn of consumer money is being diverted away from their companies in order for consumers to overpay for food, energy and other related products. That's 10% of global GDP that could be spent on assets, rather than going up in smoke every year! 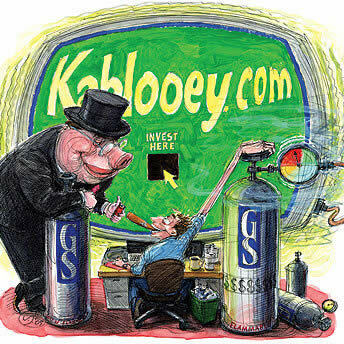 The non-energy companies need to get their own lobby together - one that calls for oversight and regulation of this industry and they'd better do it soon as our friends at Goldman Sachs are already pimping for the next $5Tn rise in energy-related spending as they raise their forecasts over the $100 per barrel mark - something that will, once again, collapse the global economy while Lloyd and Co line their pockets with record bonuses and Government bail-outs. 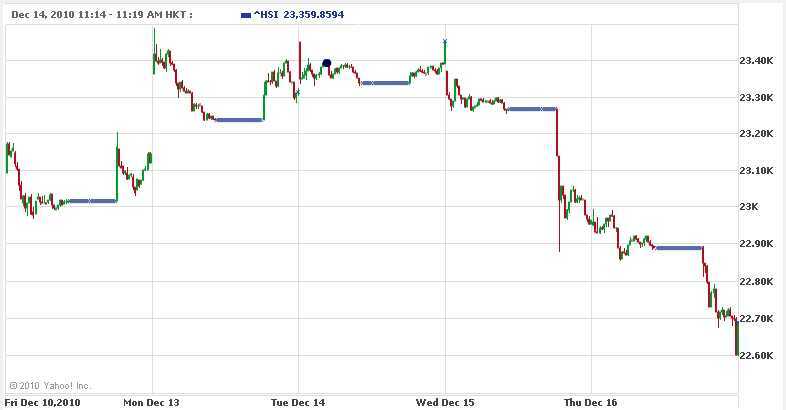 Meanwhile, has anyone noticed that the Hang Seng has dropped 800 points in 2 days? I know that doesn't fit into the Global growth narrative the MSM is shoving down our throats but surely someone is paying attention to China's rapidly declining market? Things were looking so bad this morning that Goldman Sachs tried to manipulate the market by announcing a new China-based hedge fund (2:30 am) and then the S&P jumped in at 3am and hiked China's credit rating which halted the decline for about a half hour but then they dropped another 100 points into the close. I like to play a game in the morning called "Let's see how long I can listen to CNBC and not hear a word about this" - it's lots of fun as you watch them tap-dance around mentioning any news that goes against their narrative and China falling is a big one for them to ignore but, so far today, they are batting 1,000! Copper is also in it's 3rd consecutive day of decline as expanding Global inventories can no longer be swept under the rug. 7,050 tons of copper made their way onto LME inventory yesterday and now there are 357,950 tons in storage as it appears that Shanghai is once again reaching their storage limit of 200,000 tons. We shorted FCX in Monday's Member Chat, so a little disclosure here but it's nice to see we seem to have caught that wave. Nonetheless, commodity assets have expanded to a record $345Bn as of the end of November, led by index-led investments. In other words, the relentless targeted manipulation of the markets in this low-volume rally has gotten index funds to push heavily into commodities. This allows the Goldman's of the World to turn ordinary 401K investors into commodity bag-holders right at the top of the market while retail investors are also drawn in, plopping another $6.1Bn into ETFs, a 10% increase in a single month! We have all heard that China is having inflation issues and we've all heard that the PBOC will be hiking rates next year to combat it and we all know that the average Chinese worker makes $2,000 a year yet people continue to "invest" in the China/Commodity story as if we're at the beginning and not the end. While you are BUYBUYBUYing, keep in mind that Corporate Insiders are SELLSELLSELLing, at a pace not seen since 2007! This, of course, comes as not surprise to Phil's Stock World readers, as we have a section called the "Insider Zone" that keeps us on top of what's going on inside Corporate America and you can click on that link and see lots of fun charts so I won't try to paint a picture here other than to say - Be careful out there!